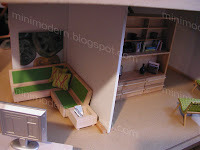 I've almost completed the first pass at decorating the 360 dollhouse. I opened up the kitchen and got rid of the table and chairs that were in there before. It didn't make sense to have two sets of dining tables when the house is open plan and the dining room is immediate to the kitchen. I have a few more details to add to the bathroom area, the pool area and the passage between the master bedroom and the nursery. Can anybody tell that I love that shelving unit? 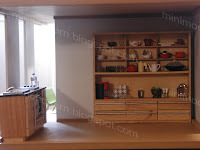 I'm an avid fan of built-ins and storage units. These shelving units are in every dollhouse I have--except the Kaleidoscope because it doesn't fit. It's relatively hard to find modern shelving and so when I saw these, I think I ordered a little too much. However, I think they do the job well in almost every room. Note to self: find some other cool modern shelving units. Seriously, I don't mean to keep copying you, but imitation IS the sincerest form of flattery. I bought the same kitchen island and shelves for the loft I've yet to build. Thanks for all of the great links, every time I think I find something new to add to my blog, I check yours and see you've already found it. Again, you rock. No worries--I mean, it's not like you can find many modern miniatures out there so we're bound to have the same items. The Shopping Sherpa and I have laughed about this in the past. ...And I wish that I rocked--HA! HI---I love your bedroom here! Where did you get the bed headboard thingy? 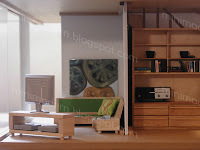 I am searching everywhere for 1:6 scale (blythe size) furniture that is modern--and not plastic 80's barbie. The panels came from some action figure but I do not remember which one. I will have to start keeping track of where items come from. If I later recall it, I will update this post. 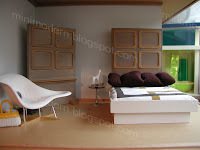 Hmm--for 1:6, the best furniture pieces that I have seen have been for the Fashion Royalty dolls, as well as the Randall Craig Home sets, Style in Scale via webshots and weaversupholsterytoo.com. 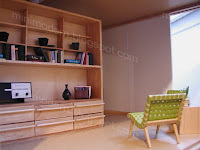 And some pieces called the Sumoon sofa and chair. Another option would be to find some of the "Barbie" pieces that have potential and hacking them with high quality spray paints, etc., etc. 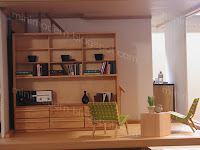 Sometimes the "Barbie" sets have great bones but the pastel colors kill it.There are some great Mattel Barbie sets from the 1950's that are made of wood and have a beautiful Danish Modern design to them--I believe there is a living room set, bedroom and dining room. They are also found on ebay. You should also peruse sites that sell toys from Asia because there is a large 1:6 scale fan base. Hello! 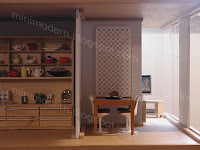 You are right, the shelving is from the Dolls House Emporium--I think item #6826. They feature it with their 1,2,3 Waterside Way dollhouse. Just want to say thanks for this wonderful blog...I check in everyday...such inspiration! 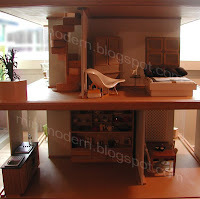 Cannot wait for the new Modern Dollhouse you mentioned today. Be still my heart. Hope I can afford it. Will also construct the Merrimack (from Earth and Tree)shortly.